Runs the SNES ROM files through emulation. See ROM files. Config file is not easily editable by the user. 256x224 resolution only, scaled to fit the screen with graphical pillarboxes added. Toggle with Alt+↵ Enter. Scaling from 1-4 and smoothing under Display dropdown. Mouse only used for windows specific menus. XInput and DirectInput. Single controller only. Windows menus and hotkeys require keyboard and mouse. Default keybindings are for keyboard and have to be changed to controller ones manually. Does have some issues recognizing controllers sometimes and requiring restart. Both games are included as regular SNES ROM files as <path-to-game>\bubsy_1 and <path-to-game>\bubsy_2. These can be played regularly played with any SNES emulator of choice, see SNES emulation for more. Might need naming extension into *.smc. As these are regular ROM files, emulator can be used to play other SNES games by simply replacing the files, however compatibility is not quaranteed. ↑ 2.0 2.1 File/folder structure within this directory reflects the path(s) listed for Windows and/or Steam game data (use Wine regedit to access Windows registry paths). Games with Steam Cloud support may store data in ~/.steam/steam/userdata/<user-id>/426630/ in addition to or instead of this directory. The app ID (426630) may differ in some cases. Treat backslashes as forward slashes. See the glossary page for details. 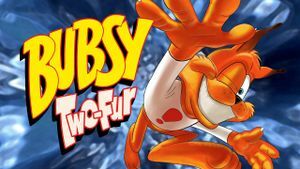 "We first would like to direct anyone that still has questions about permissions to use the emulator found in Bubsy Two-Fur to this blog post by our developer Piko Interactive."